Empathy is the capacity to understand what another person is experiencing from within the other person’s frame of reference, ie, the capacity to place oneself in another’s shoes. Therefore doctors who are able to empathise with their patients, tend to be more compassionate and able to offer better options in treating their patients. If the doctor has experienced the same spectrum of disease as the patient, he would be able to empathise better. When it comes to urolithiasis (stones in the urinary tract), I can empathise very well indeed since I had it 3 times already! Ramadan in 1990 (April 1990). It was initially misdiagnosed as gastritis by a GP on UKM panel since it happened in Ramadan. Towards the end of Ramadan, a sharp MO in Melaka A&E correctly diagnosed it when I was admitted for acute abdomen. I was treated with oral ingestion of potassium citrate mixture to alkalinise the urine. In an acidic urine, the calcium lactate stone will become larger, that is why we need to alkalinise the urine. The stone came out by itself about 3 months later. About 0.5 cm in size but with plenty of sharp spikes. Ramadan in 1999 (January 1999) – I was already a medical doctor and I self-diagnosed the cause as urolithiasis. 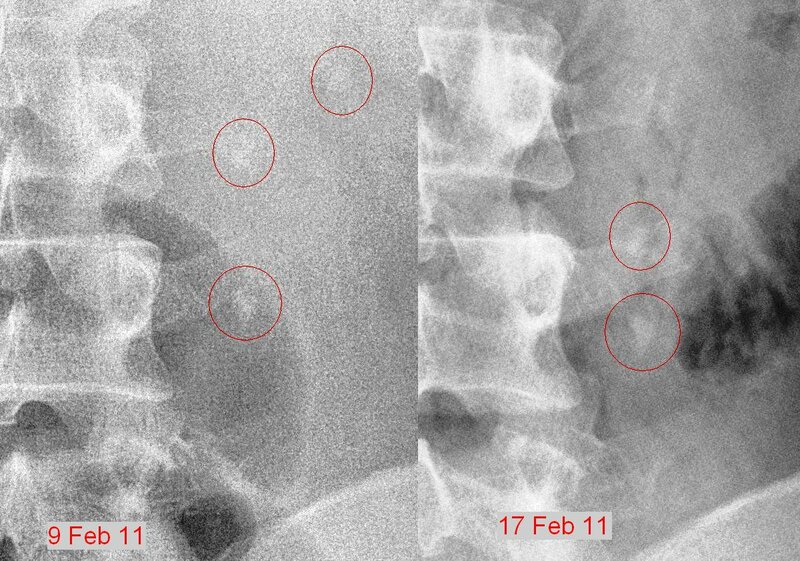 After various attempts of “traditional treatment” with a bomoh in Pagoh/Tangkak, the situation got worse instead and the stone was stuck at the pelvi-ureteric junction. I consulted a urologist at Hospital Tawakal and had ESWL (extracorporeal-shock-wave-lithotripsy) done. 8 February 2011 – I was recovering from a very long bout of acute asthma and had been on high dose steroid for about 2 months when once again I presented with acute abdomen. This is the episode that I would like to share here. I rode 25km on the trainer on the 8th February 2011. So that night when I suffered acute abdominal pain, I thought it was intestinal obstruction due to old surgical adhesions. It happened once before in November 1993 after shifting house. The increase in exertion caused the scar tissues to strangulate the intestinal loops. Since it was at night, I persevered against the pain and waited for daylight before driving myself to the UKM Hospital. Hoping for the best, I did all the necessary investigation including abdominal X-ray (to look for air/fluid level) and Urine FEME. The X-ray report came back as “no abnormalities detected”. UFEME – RBCs seen in urine. But the Urine FEME came back positive for RBCs, so my provisional diagnosis shifted towards urolithiasis. I downloaded the X-ray film and e-mailed it to a surgeon in Hospital Kuala Lumpur. He confirmed my suspicions by replying, “Congratulations, you got triplets!”. Location of the 3 stones in reference to the spinal column. So two days later, I arranged for an ultrasound appointment to confirm the diagnosis of urolithiasis. 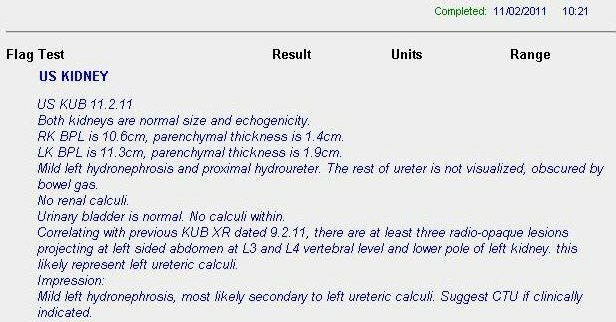 US – confirmation of the urolithiasis. The ultrasound report confirmed the diagnosis. I started treating myself by ingesting potassium citrate mixture 3 times a day to alkalinise my urine. 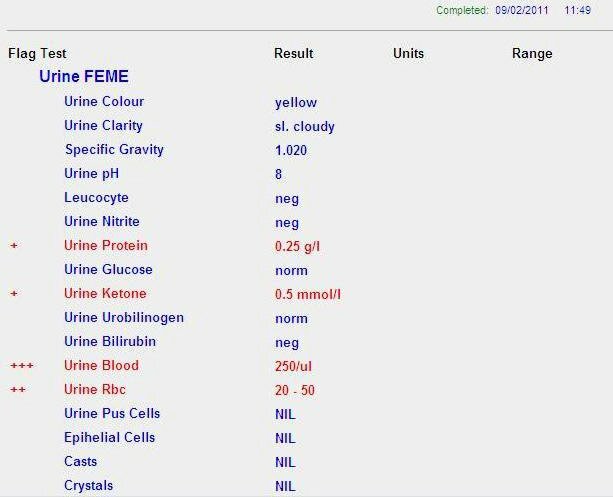 I also had UFEME done regularly to monitor the presence of RBCs in the urine. A week later on 17th Feb, when the RBCs were no longer being detected in the urine, I had another KUB X-ray done. Comparison of the stones location between 9th & 17th Feb. The KUB on the 17th indicated that the bottom stone was still at the same site but the other two stones has come together and now were on top of each other. 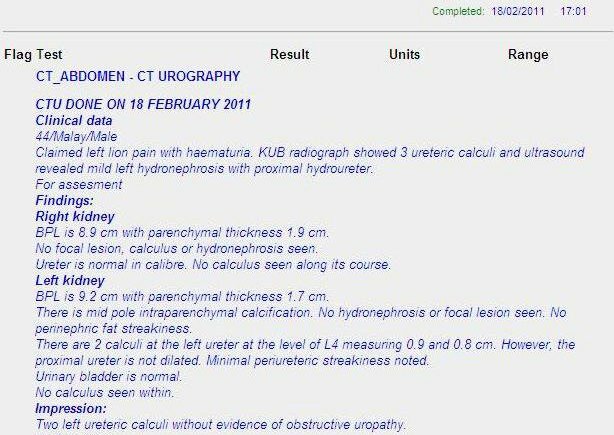 But there was no RBCs coming through, so either the bottom stone was blocking everything or the bottom stone had stabilised and was no longer cutting across the surface of my ureter, so no blood in the urine. KUB report for 17th Feb. The uncertainty affected me, since a total blockage would cause a back flow of the urine, thereby affecting my left kidney. I consulted the urologists in UKMMC and they told me to get CT urogram done. I managed to get a CT scan done on the very next day on the 18th Feb.
CT Scan showing the location of the 3 stones. 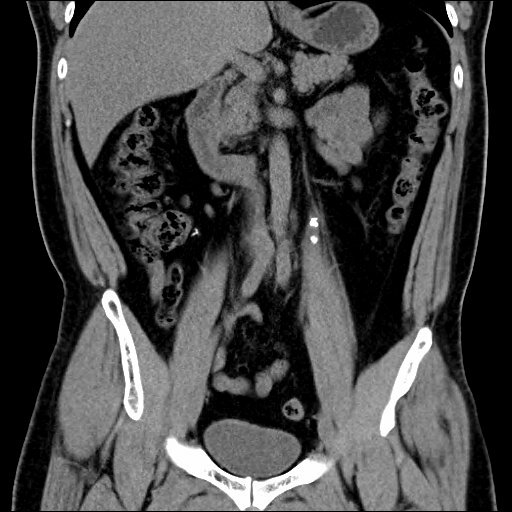 You can clearly see the stones in the CT scan film. Can you see it? Hint – the two white spots in the middle of the picture. CT Scan report 18 Feb. 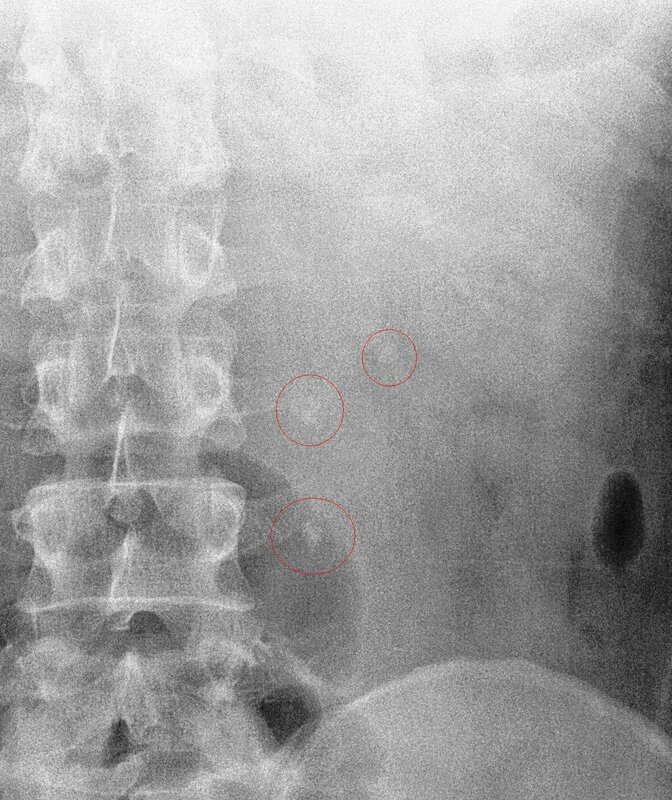 The CT scan report indicated that I had 2 humongous stones (9 and 8 mm in diameter). There was no way that these stones could come out through the urethra since they won’t fit through the urethra nor the urethral opening. 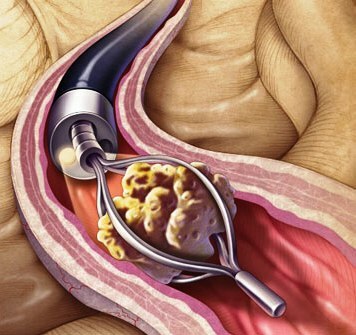 The UKMMC urologists suggested laser pulverization of the stones and removal via urethroscopy. Laser pulverisation of the stones. I readily accepted their suggestion. I was admitted on the 22nd Feb and I was scheduled for surgery at 11 am the next day. One of the three anesthesiologists in the OT room. Words travel fast in the OT and suddenly I had 3 anesthesiologists in the room, one a former course mate and the other my cycling buddy. The cycling buddy kindly gave gas via mask throughout the whole procedure, so that when I woke up, there was no throat pain due to the endotracheal tube insertion. Thanks Prof! The procedure took longer than expected since the third stone flew back into the kidney when the second one was being imploded by laser. It was only done by 3 pm. So I really owe all of them a big thanks! Post-surgery – confirming the location of the stent. After surgery, there was another KUB done to confirm the location of the stent. 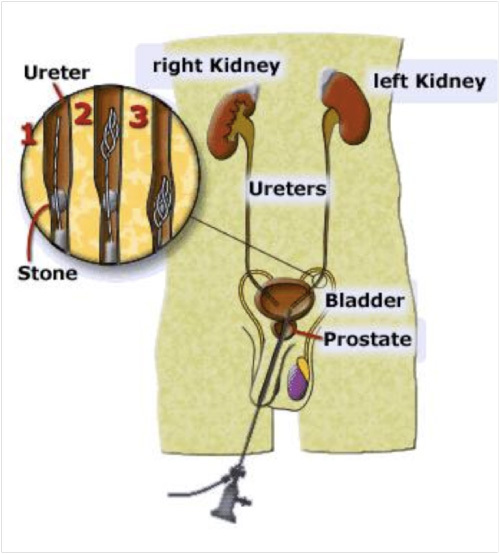 The stent protects the ureter from any leftover debris of the pulverised stones. KUB report for 24th Feb. The X-ray report confirmed that the stent was in the right place. I was out of the OT by 3 pm. At 6pm, the surgeon allowed me to remove the CBD (continuous bladder drainage). I was no longer bed-ridden therefore I was a happy man, and I immediately went down to surau to pray asar and qada’ zohor. Sadly the shops were closed already by then, so I couldn’t buy anything to eat. After 24 hours of observation, I was discharged on Friday morning. The discharge procedure was tedious, especially the wait at the discharge pharmacy. After more than one hour of waiting, I was only given Panadol for my pain control! Those prescribing did not realise that Arcoxia was not available for discharged patients. I drove myself back to Subang and surprised my wife. She was on the line with my mother, who was telling my wife to go and pick me up at the hospital. But I was already home! Life with the stent was horrible though. You would be passing urine almost every hour, day and night. 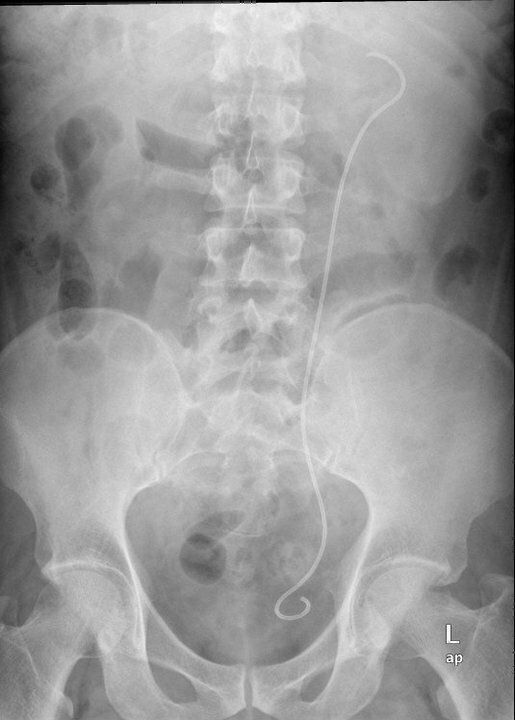 As your bladder becomes smaller with micturition, the lower end of the stent would be pulled downwards. Therefore it would also pull down your kidney. That pain had to be experienced to be believed. It was worse than the pain of the stones itself! After 3 weeks, I had severe pain upon micturition and the stent was removed on 16th March via local anaesthesia. After removal, I passed out blood clots in my urine for a whole day. I didn’t know why the clots were there nor what was causing that intense pain. Anyway I was glad that the stent was gone. 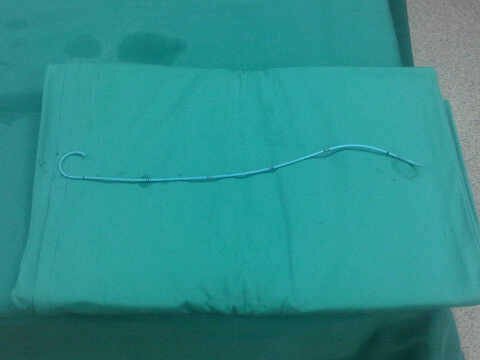 The stent after removal on 16th Feb. I was on Uracil (potassium citrate mixture) for a few months after that. Hopefully the urolithiasis won’t recur again. My utmost thanks to the Urologist team in UKMMC. I wish I could name all of those who have assisted with my care but it may be a breach of their privacy. Anyway you know who you are, and thanks bros & sis. 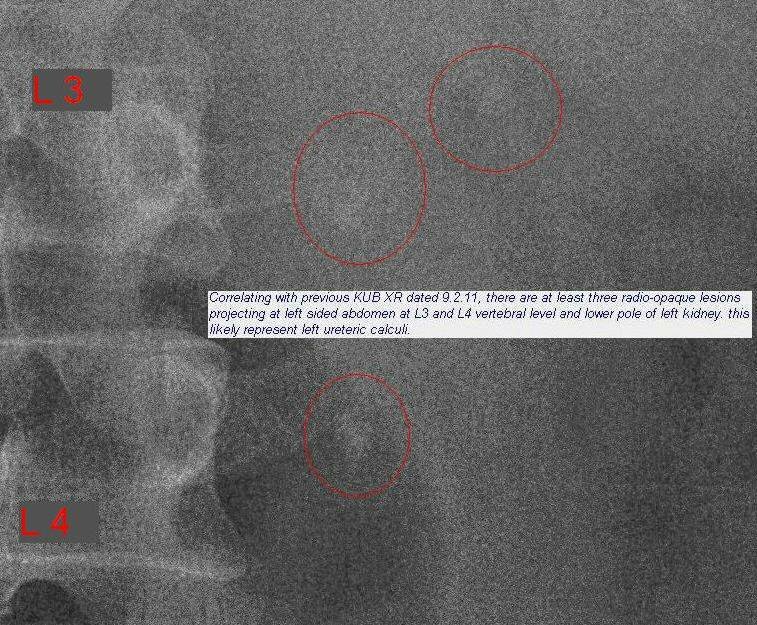 Interesting story prof…i’m glad those stones are out..having many medical doctors friends (including cycling buddies) sure help in this kind of situation. I’m quite surprised though the initial report of your KUB stating no abnormalities detected hehehe…..
Utilising postgrad students as service MOs to read the films may be the root of the problem.